Oh, and there's Nye's story of Doris Kopsky, America's first national women's champion. Dig in! From the era of snub-nosed cars and dirt roads, of cyclists wearing goggles over their eyes to keep out the ubiquitous dust from the roads, and racers wrapping a spare tire over their shoulders and across their backs in a figure-eight, a lone U.S. rider enjoyed success as a professional on the roads of Europe. 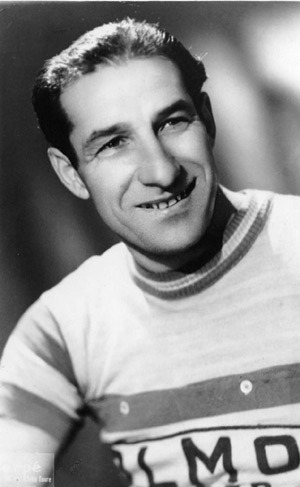 Joseph Magnani of Illinois raced professionally from 1935 to 1948 on French and Italian teams. He was so ahead of his time that few in his homeland knew of him. 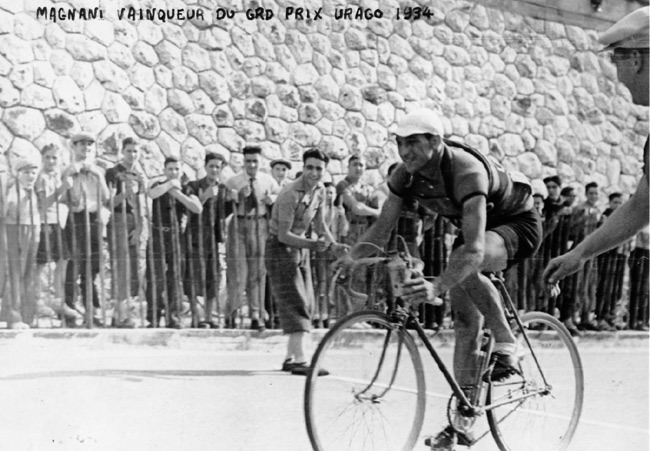 In the 1947 world championship professional road race in Reims, northeast of Paris and famed for its champagne vineyards, Magnani finished seventh. He raced 171 miles through torrid heat that forced most of the starters, including legendary Fausto Coppi, to abandon. When results reached the United States where his performance should have been celebrated, however, Magnani's name only piqued confusion. "If anyone knows who he is or where he came from to represent America, we would like to hear about it," wrote Otto Eisele, secretary of the Amateur Bicycle League of America (predecessor to the U.S. Cycling Federation and USA Cycling, Inc.), in American Bicyclist, then the only national cycling publication. Ironically, some of Magnani's triumphs had been reported previously in the magazine during the 1930s. His victory in the 1935 Marseille-Nice road race classic had astonished everyone when it catapulted him to world-class stature. He won other races and performed well in one-day classics such as Milan-San Remo. In the post-World War II years, however, the earlier reporting was forgotten and confidence in American cycling sagged so badly that a U.S. rider holding his own against the Europeans apparently seemed to stretch credibility. In mid-1948, Magnani returned to America with his French wife and their son to visit Chicago relatives and was recruited by the Schwinn Bicycle Company in Chicago to ride the American indoor winter six-day circuit. After a crash that October during the Buffalo six-day forced his retirement from cycling, he promptly went to work for Schwinn and settled in Chicago. From late 1948 until illness overcame him in the early 1970s, Magnani assembled all of the Schwinn Paramount track and road racing bicycles. In his free time, he coached Chicago riders, including son Rudy, a medalist in the Illinois district championships. Eisele's question about who Joseph Magnani was and how he came to represent America at the 1947 worlds remained unanswered even after Magnani died in 1975 at age 63, a year before Eisele himself died at 74. Only Magnani's immediate family, some Schwinn colleagues, and a few friends knew about his participation in major European national tours and one-day classics. Word-of-mouth rippled through the Chicago-area cycling community about a local rider who had competed successfully on the roads of Europe. Word-of-mouth gave way to stubborn rumors that turned into the mystique of a Schwinn employee as the first U.S. rider in the Tour de France--cycling's equivalent to Elvis sightings. Later, in 1976, Mike Neel of Berkeley, California, rode on the Italian professional team Magniflex and finished 10th at the worlds pro road race in Ostuni, Italy. His performance at the time represented a major advancement for American cycling. Magnani's previous seventh place had been forgotten by a new generation that reported Neel had achieved the highest-ever placing at the world's by an American. How could the one American, Joseph Magnani, whose professional career spanned 14 years, even enduring imprisonment during World War II as an American captured in German-occupied France, in the pro peloton with legends such as Coppi and Coppi's rival Gino Bartali go completely overlooked in his homeland? "My father lost a whole box containing newspaper and magazine clippings, team jerseys, racer-leader jerseys, and photos of his career," explained his son Rudy, born in France while his father raced there and now living in Chicago. "Everything my parents and my father's sister had saved from his years of riding was in a box that got lost on its way from Nice, France, to Chicago. That box just disappeared. And my father had a quiet, self-effacing personality. He didn't draw a lot of attention to himself." In international cycling, Magnani--routinely referred to in French accounts as l'Americain--earned a reputation as one of his generation's strongest riders. His reputation has proved durable. Several photos of Magnani in his prime years recently turned up neatly framed and mounted on walls of a Washington, D.C., restaurant. One photo shows spectators cheering Magnani as he crosses the finish line triumphantly in the 1934 Grand Prix Urago in Nice. Another catches him peeling off after his turn leading the breakaway during a stage of the 1938 Paris-Nice, on his way to finishing ninth overall. 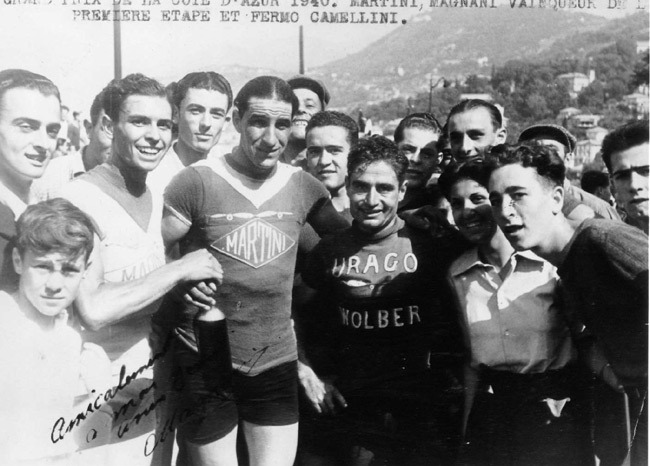 In another photo, he stands with the bicycle manufacturer Giuseppe Olmo and Olmo team riders and support crew at the start of the 1946 Giro d'Italia. "Joe Magnani and Jean Veneziano, who went on to become assistant director sportif of the Ford Team with Jacques Anquetil, raced professionally together on the Urago team," said Pierre Mattia, an Italian native and co-owner of Coppi's Vigorelli restaurant in Washington where the photos are displayed. "Jeannot, Jean's nickname, saved everything from his racing days. That includes a lot of information on Joe Magnani." When Mattia prepared to open the second of two Washington restaurants named after Fausto Coppi, the Italian cycling icon called Il Championissimo (champion of champions) for his breadth of achievements that included setting the world hour record on the Vigorelli Velodrome in Milan, Mattia journeyed in the summer of 1996 to Bordighehra, on the Italian Riviera bordering France, to visit Veneziano. "Jeannot gave me this treasure trove of photos," Mattia gestured with a wave of the hand that swept the walls of Coppi's Vigorelli restaurant adorned with many dramatic black-and-white photos of European racers. "He gave me the photos because he loves the sport. This is a way to contribute to cycling being better known in the United States." Now finally Eisele's question can be answered about who Joseph Magnani was and how he came to represent the United States years long ago at the 1947 world championships. Joseph Magnani (pronounced Mahn-yan-ee) was born in 1912 to an Italian-immigrant family in LaSalle, Ill., a coal-mining town in the middle of Illinois. He grew up in Mount Clare, between the state capital in Springfield and St. Louis, according to his youngest brother, Father Rudolph Magnani, a Catholic priest in Bethesda, Maryland. In 1928, sixteen-year-old Joseph Magnani, the second in a family of eight, and his elder sister, Angelina, were sent to live with relatives in southeastern France. "His father had fallen on hard times in the mines," explained his widow, Mimi, of Chicago. "Joe and his sister were sent to France to make the family smaller." They lived on a farm in Cap d'Ail, a small tourist town near Nice on the French Riviera within sight of the purple Alps bordering Italy. "Joe and his sister lived across the street from my family," said Mimi. "He delivered coal and wood to residents in the area." He also joined the local amateur team, Club Cyclo-Tourists, sponsored by Urago Cycles, a family-owned bicycle manufacturer in Nice. Francois Urago was one of France's top racers and gave Urago Cycles a publicity boost when he won the 1930 national motorpace championship. By 1934 Magnani, 22, started adding to the company's publicity. He won the Grand Prix Urago against a field of 85 starters. Finishing fifteenth was his Italian friend Fermo Camellini, destined to win Paris-Nice and stages of the Tour de France. Magnani stood 5 feet 11 inches. The French press described him as thin and strong. Photos show him looking trim, with his dark hair parted in the middle and combed back in the day's fashion. Two dozen French bicycle manufacturers such as Urago, Peugeot, Terrot, and Automoto each supported a trade team to help promote their products. Several hundred aspiring riders competed for berths on the teams. "Getting a contract to race for one of the pro teams was tough," said his wife. Since Magnani had experienced hardships brought on by his family's poverty in Illinois and had discovered road races in France to match his talents and temperament, he took cycling seriously. In the off season, he chopped wood to strengthen his upper body. He told an interviewer that he prepared for the new racing season by training 2,500 miles. This preparation and his will to succeed propelled him to consistent top place victories that enhanced his popularity as a rider on the French Riviera. The area featured high-quality racing, and the hilly region developed many national-level climbers, including Magnani, considered tall for a climber. In 1935 Urago Cycles offered Magnani a coveted pro contract. As an American expatriate, he was required to obtain a license from the American governing body, the National Cycling Association, based in New Jersey. Magnani wrote to the NCA and received back his license, issued by America's long-standing national sprint champion Frank Kramer. America had several sprinters who went to compete in Europe, but Magnani became the only American racing on Europe's roads. 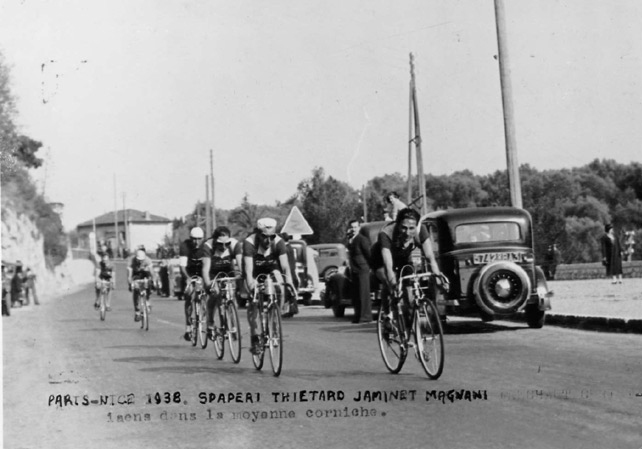 One of the 1935 season's classics was the Marseille-Nice road race. Dating back to 1897, previous champions had included Gustave Ganay, a favorite of Ernest Hemingway, and world champion Alfredo Binda. During the 1935 Marseille-Nice event, Magnani executed a bold break to win in the final kilometers after seven hours of racing. His victory earned him a place in the pro peloton--as well as glory with his name and nationality, USA, still listed in VeloPlus, the European cycling record book (Marseille-Nice was discontinued after 1959). "There wasn't much money in the 1930s," observed his wife. "The Depression was on. What kept him racing was that he was making a pretty good living." Making a good living meant racing even in horrendous weather, such as his 1938 victory in the 149-mile Marseilles-Toulon road race during a torrential rain storm--only four of the 80 starters finished. He also competed in the one-day classic, Milan-San Remo for the second time and finished a respectable 29th. That summer Magnani won the two-day Circuit of Lourdes, a strenuous event that crossed some of the highest peaks of the Pyrenees Mountains. Although he specialized in road races, he set a new hour record for the Nice Velodrome when he pedaled 42 kilometers (26.25 miles). Magnani's performances generated attention in the French press. France's sports daily L'Auto (renamed l'Equipe) published a feature about the American riding Europe's road races, and the feature was cited in American Bicyclist. French journalist Jose Meiffret exclaimed to readers, "Attention! Follow this man! Urago has on its hands a rider of great quality." At the top of bicycle racing then, as now, loomed the three-week Tour de France. Unlike today's format with trade teams composed of international riders, the Tour in Magnani's era involved national teams. That format excluded Magnani, the lone U.S. road rider (several other U.S. riders competed in Europe, but chiefly on the tracks). Magnani's performances, however, earned him consideration to ride the Tour de France on an international composite team, recalled Al Stiller of Boulder, Colo., who worked at Schwinn with Magnani. "But a Canadian who came up with more money bumped him off the team," Stiller said. For the 1939 season, Magnani left Urago to join another French pro squad, Terrot. In the spring, he won the first stage of the 11-stage Tour of Southeast France that covered 1,250 miles. That put him in the race leader's blue jersey. He also scored a third place in the third stage. But after the first week he lost the lead and finished seventh overall. At age 27, he had only begun to reach the top of his game. Then Germany invaded Poland. War erupted, and the world championships scheduled that year in Italy were canceled. Magnani moved to the Italian team, Martini, where he joined his friend Camellini for the 1940 season. In the spring, German tanks and troops blitzed across northern France and captured Paris. German troops seized the Union Cycliste Internationale headquarters in Paris and moved the sport's governing body to Berlin. Although the war escalated and the German army occupied the northern half of France, bicycle racing continued in southern France to offer at least an outward appearance of routine life. Magnani won the opening stage of the 1940 Grand Prix de la Cote d'Azur. He and Camellini posed with Magnani's fiance, Mimi, for a celebratory photo. From the left: Joseph Magnani (matini jersey) poses with Fermo Camellini (Uraho) and his fiance Mimi. Joseph and Mimi, a petite dark-haired woman, married at the end of the racing season in October 1941. Magnani had enjoyed a good season on France Sport team. He had won a stage of the Circuit du Mont Ventoux, and finished 10th in the Grand Prix des Nations time trial. War hostilities intensified globally. On December 7, 1941, the Japanese bombed Pearl Harbor; the U.S. Congress promptly declared war. Magnani had signed to race the 1942 season on France-Sport, a big professional team with greater resources at his disposal than ever before. His team mates included Rene Vietto and Dante Gianello, two of the period's biggest names. Despite wartime hardships, Magnani traveled with his teammates to races in the southern half of France. As an American in France during German occupation, however, Magnani became a marked man. After U.S. and English troops landed in North Africa in November 1942 to fight the German troops, German troops in northern France moved into southern France. "In February 1943, the Germans arrested Joe because he was an American," Mimi said. "They put him in a concentration camp in the north of France." "Joe was practically starved in the concentration camp," said Father Rudolph Magnani. "Our family sent him care packages with food, but we had no way of knowing how much got through to him. His weight dropped from 170 pounds to 98 pounds." After U.S. and British troops launched the Normandy invasion on France's northwest coast in June 1944 and weeks later liberated Paris, Magnani and others were set free. Magnani joined his wife after more than two years of incarceration. When their son was born in July 1945, they named him after Joseph's youngest brother, Rudolph. In the post-war years, the UCI relocated to permanent headquarters in Geneva, events that had been suspended for several years started again, and Magnani joined others who resumed their cycling careers. By 1946, Giuseppe Olmo--a gold medalist at the 1932 Los Angeles Olympics, former world hour record holder, and Giro d'Italia stage winner--had retired from racing to found a company to manufacture bicycles in his name. Olmo hired Magnani and Camellini to ride for him. Italy's three-week national tour, the Giro d'Italia, had been suspended for six years, making the 1946 Giro the battleground for all of the Italian teams. Olmo picked Magnani to ride on the Olmo squadron in the Giro, thus adding that prestigious stage race to a long list of firsts that he scored for U.S. racers on Europe's roads. Much of the Italian public was divided in support of Fausto Coppi or his rival, Gino Bartali, a devout Catholic nicknamed "the Pious," while other pros such as Camellini and Fiorenzo Magni fought for attention. 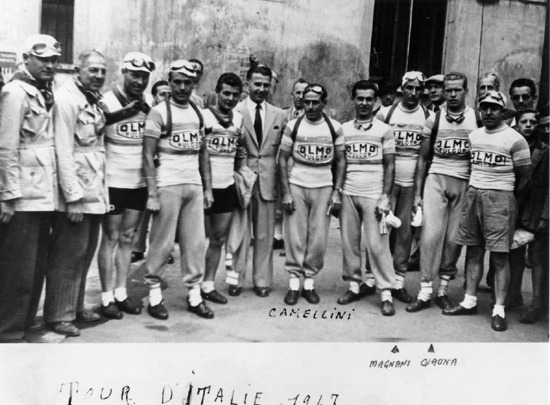 The 1946 Olmo team for the Giro. Magnani is the third Olmo rider from the right. According to Veneziano, Magnani rode support for Camellini, who wore the race leader's pink jersey during the second week. Then Magnani fell heavily in a crash. "He banged up his knee and couldn't race because of infection, so he came back home to recover," said his wife. Camellini couldn't defend the leader's jersey as Coppi and Bartali dueled, with Bartali ultimately triumphing. During the 1947 season, Magnani scored ten top-ten results, including a second place in the final stage of the Tour of Normandy. At the Tour of Switzerland, he finished ninth in the time trial stage that Coppi won, and seventeenth overall in the event that Bartali won. Late in the summer during a heat wave, Magnani, 35, entered the world championship road race in Reims, over a hilly course designed for Grand Prix car racing. Among the field of 31 starters were Coppi, Albert Sercu (father of 1964 Olympic gold medalist and six-day racing legend Patrick Sercu), Italy's classics winner Fiorenzo Magni, and Holland's star Theo Middelkamp. "The amateur race was held in the morning when the weather wasn't bad, but by the time the pros started after noon, it was really hot," recollected Al Stiller, who represented the United States at the world championship track events on the Parc des Princes outdoor track in Paris. "The temperature hit 100 degrees Fahrenheit, with humidity to match. The heat knocked Coppi out." Only seven riders finished, the fewest ever in a worlds road race. Middelkamp won, in seven and a half hours of racing, with Sercu in second. Magnani held on to finish seventh--the best U.S. performance at the worlds for 33 years. For the 1948 season, Magnani rode for L'A.S. Monaco team, a small team sponsored by the Mediterranean principality, and started talking about retiring. "In July 1948, we came to the United States on a vacation trip," said Mimi. "Joe hadn't been back to visit his family since he had left so many years before." "When he came back," said Father Rudolph Magnani, "I was an adult, 18, seeing him for the first time. I was really thrilled. I wore my best shirt." After the Magnani family reunion, Joseph Magnani presented a letter of recommendation from Urago Cycles to the Schwinn Company, Mimi said. Of the half-dozen bicycle manufacturers in the United States, only Schwinn supported professional and amateur racing. Professional racing in America was limited to winter indoor six-day races, in which teams of two riders each alternated riding so that one cyclist competed while his partner ate or took a nap during the event of six days and nights straight. Schwinn hired Magnani to ride the winter indoor circuit. The 1948 winter circuit started with the 12th international six-day, October 5 to 11, in Buffalo's Memorial Auditorium. Fifteen two-rider teams entered the event around the new portable Masonite track, 10 laps to the mile. Riders included Hugo Koblet, the Swiss rider who would win the 1951 Tour de France, paired with compatriot Walter Diggelman. Magnani teamed with Bill Johan, one of Chicago's hot young riders in his first six-day. "Joe was really out of his element," said Bill Jacoby, a Chicago native who paired with Alf Letourner of France to finish fifth. "That track was a far cry from the roads of Europe which Joe rode so well." Crashes day and night reduced the field to just six teams. Among the casualties were Magnani, Johan, and Koblet. The vacation to Chicago turned into a permanent move as Schwinn hired Magnani to work full-time. With about 1,000 registered amateur racers nationwide, American bicycle manufacturers concentrated on the juvenile market. Schwinn also relied on the juvenile market, but deployed some of the profits to promote bicycle racing. Schwinn was the only U.S. bicycle manufacturer to make a racing frame, hand-made with Reynolds steel, called Paramount. "Joe worked for me in the Paramount room, a large warehouse space with a high ceiling off the assembly line,' said Stiller, an engineer who had competed in the 1948 London Olympics. "Joe and two or three other guys assembled Paramount track bikes and tandems. In the early 1950s, we started building Paramount road bikes, and Joe assembled all of them." "Joe Magnani was a remarkable technician," observed Richard Schwinn, a fourth-generation bicycle manufacturer and former company vice-president who saw Magnani in action on the job. With all of his training and racing experience, Magnani shared his expertise with local riders. Fritz Masanek, now living in Aurora, Illinois, said Magnani prevailed upon his Urago Cycles connections to arrange for a shipment of complimentary Urago road bicycles, equipped with eight-speed derailleurs--rarities in America, still holding to the tradition of one-speed fixed gears from the salad days of track racing. Magnani also helped Masanek prepare for long European-style road races in eastern Canada that contrasted to the U.S. racing diet of criteriums, most often limited to 50 miles. "We rode together on the weekends, and he gave me many pointers," Masanek said. "He had a lot of endurance. A couple of times in training with several of the best Chicago-area riders, Joe would shift into a big gear and just drop everybody." Magnani's coaching helped Masanek win the 1949 Winnipeg-Kenora race of 150 miles. "I wore my Urago jersey and pedaled my Urago bike," Masanek said. In one-hour team races that enjoyed popularity at the Brown Deer Park track in Milwaukee and Washington Park track in Kenosha, Masanek and Stiller competed together while Magnani coached from the sidelines. 'Joe helped us as much as he could with tactics we might use, how we looked," Masanek said. "He gave us water." For Masanek, training and racing focused on the 1951 Pan American trials in St. Louis to determine team selection for the First Pan American Games, in Buenos Aires, Argentina. Masanek finished second in the road trails, although the sport's governing body could afford to send only one road rider to Buenos Aires. He subsequently spent a year and a half competing in European-styled events in Mexico where he won 18 races. "I rode for AutoMoto, a French bicycle company that had a subsidiary plant in Mexico City," Masanek said. "Three French riders were on the team, and they all knew Joe Magnani pretty well from his racing in France." When Rudy Magnani came of age in the early 1960s, his father coached him. "He always came out training with me," Rudy said. "We did a lot of traveling--Tuesdays we were on the track in Kenosha, Thursdays in Northbrook, and Sundays at Brown Deer Track. We didn't get home till after 11 P.M. And Dad always got up at 5:30 the next morning to get to work." Results show that Rudy Magnani won a silver medal in the 1965 Illinois district sprint championship, and a bronze in the 10-mile. "That was my last year of racing. That fall I quit cycling to enroll in the Art Institute and the University of Chicago. I probably disappointed him when I decided to go on to art. But if he was disappointed, he didn't express it. Winning wasn't everything with my Dad. His philosophy was to enjoy the sport." The younger Magnani went into advertising, and his company worked on the Schwinn Company account. Richard Schwinn, a company vice-president, dined frequently in the Magnani household. "Mama Magnani is a wonderful cook," Schwinn said, cheerfully patting his comfortable belly. "She cooks wonderfully rich French food in the provencal style." He laughed indulgently. "That woman doesn't know the word hungry." In the early 1970s, despite his athletic talent, Joseph Magnani was overtaken by a debilitating neural affliction. "My dad had always been active, quite vigorous in fact, and not being able to get around because of illness depressed him," his son said. Magnani died November 30, 1975. "U.S. cycling started coming back around in the 1980s," remarked Rudy Magnani. In 1980 at the worlds pro road race in Salanches, France, Jonathan Boyer of California finished fifth, improving upon Magnani's place at the worlds. "My dad never saw any of the professional movement. He would have had a lot to talk about with today's pro riders here in America." Joseph Magnani, an American pioneer in road racing, left a legacy. Today his son's company, Magnani & Associates in Chicago, consults on advertising for Richard Schwinn, now vice-president of Waterford Precision Cycles. Magnani & Associates also does marketing and advertising for Mongoose Bicycles. That legacy is well represented today. Thousands of Schwinn Paramounts he put together are still ridden--many prized by collectors. Joseph Magnani continues riding, forever in his prime on the roads of France and Italy, as captured in photographs prominently displayed at Coppi's Vigorelli restaurant. Highlights of Joseph Magnani"s professional career. Compiled by the editors of Coups de Pedals 67, published in the July-August 1998 issue.